Foreclosure activity continues to slow throughout the United States. According to data from RealtyTrac, a national foreclosure-tracking firm, the number of foreclosure filings dipped below 215,000 in September 2011, a 6 percent decrease from August. A “foreclosure filing” is defined as any foreclosure-related action including Notice of Default, Scheduled Auction, or Bank Repossession. September marks the 12th straight month in which foreclosure filings fell year-over-year. There are several reasons why foreclosure filings are down, including an increase in the amount of time it takes banks to move a foreclosure through its pipeline. It now takes a nationwide average of 336 days from the date of initial default notice to bank repossession. Some states work quicker than others, however, because of a combination of state law and personnel. Homes in New York take an average of 986 days to foreclose, for example, the longest in the country. 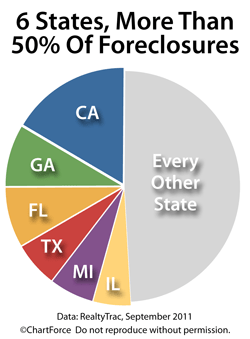 Homes in Texas foreclose the quickest, registering just 86 days. Collectively, these 6 states represent just 36 percent of the nation’s population. By contrast, the bottom 6 states were home to just 192 repossessions last month — 0.3% of the national total. Those 6 states were Alaska, Wyoming, District of Columbia, North Dakota, South Dakota, and Vermont. For home buyers , shopping for foreclosed properties can be an excellent way to get “a deal”. Foreclosed homes typically sell at discounts as compared to “non-foreclosed” homes, but are often sold “as-is”. This means that homes listed for sale may be defective or out-of-code. Before placing a bid on a foreclosed home, make sure that you’re represented by an experienced real estate professional.